Education, Culture and Politics in Modern France is concerned with the interrelationships among educational theory and practice, culture, and politics in France, with emphasis on the process of educational change during the first fifteen years of the Fifth Republic. 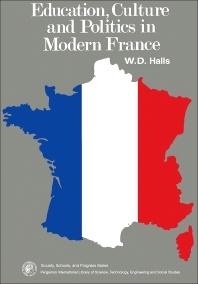 This book presents a contemporary history of education in France and examines the debate about its schools and universities, as well as some of the underlying factors that account for the passion of the argument. This monograph argues that a new view of culture—defined as all the artefacts of men, whether these be material objects or their thoughts, ideas, beliefs and opinions—has enlarged the narrower, more literary concept that has swayed French education for 170 years. The discussions are organized around historical and cultural aspects; administration, finance and planning; schools, teachers, and society; and the politics of education. Government policies and school administration in France are analyzed, together with planning and budgeting for education; social factors in schooling; and the reform of higher education. Politics and education from 1958 to 1968 and since 1968 are also discussed. This text will be a useful resource for educators, politicians, sociologists, and political scientists as well as policymakers in the fields of education, culture, and politics. 8. Fifteen to Eighteen: The "Phase of Determination"